My visit to the Vet! I’ve just been out to Ardene Vets at Westhill. Daddy took me out because he was concerned about my hind legs. For a long time now, I have had great difficulty in getting up steps especially if they’re shiny and slippery, so it was decided to ask Ardene to check them. The lady vet did so and she diagnosed me as suffering from luxating patella, or to put it in terms that non-bulldog people can understand, my hind leg kneecaps pop out! I heard the vet say to Daddy that if I was in pain then one alternative would be to do an operation, or simply just leave them. Daddy’s viewpoint was he did not want to put me through an anaesthetic and all the various problems of an operation if I don’t seem to be in pain most of the time, and I’m not. So at least I now know why I have difficulty climbing stairs! Oh I’ve been busy again. On Thursday, 20th August, there was a bar-b-que for all the Home Owners, and Head Gardener Jim and his staff erected a marquee. Normally I’m at the bar-b-que and Colin, the Head Chef at Inchmarlo, usually – unofficially – gives me a few of the sausages. Unfortunately, Daddy had another appointment which meant I couldn’t be there, which was very disappointing. However, Daddy and I went out to Inchmarlo later on and I supervised the taking down of the marquee – here I am standing with Head Gardener Jim and Team Leader, RJ. I then got a request from Mrs M at QVP, who likes bulldogs so much that she went and purchased a ceramic bulldog puppy. She asked Daddy if she could get a photograph of me beside the bulldog and, of course, I obliged. Here’s the photograph, doesn’t the puppy look absolutely wonderful. 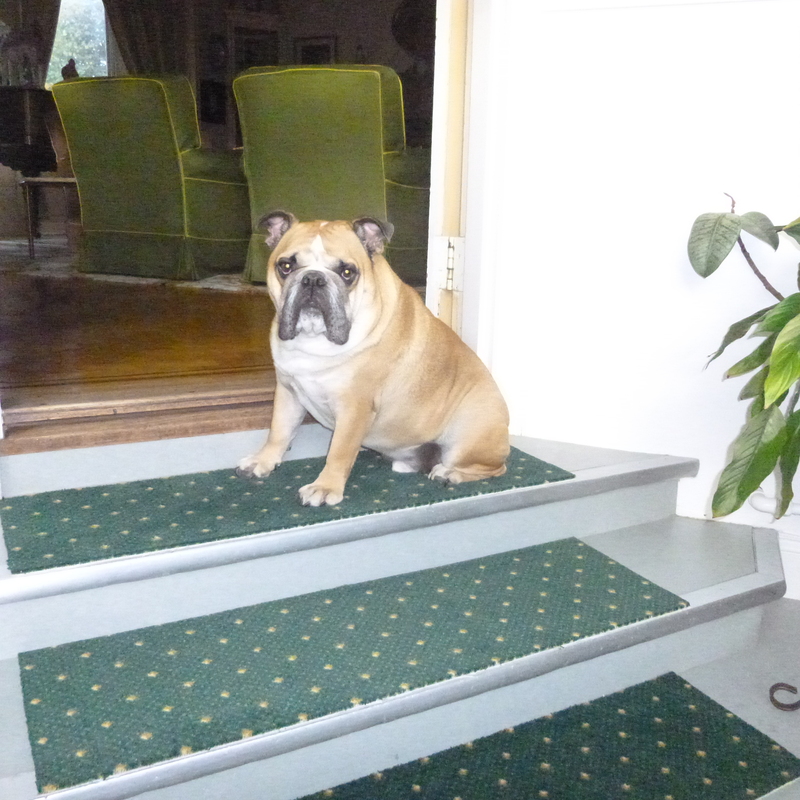 But of course all bulldogs look absolutely wonderful! Oh what an exciting day. Daddy and his co-directors decided to hold a Garden Party on the lawn, all the Home Owners were invited plus one or two outside guests. Daddy and I checked the two marquees were correctly positioned. The big marquee was for the Home Owners and the small marquee was for the ‘The Blackburn and Darwen’ Jazz Band, who were attending the Aberdeen International Youth Festival. It was a nice day at Inchmarlo but unfortunately as the day went on the weather changed. The band were going to play outside but because of the spitting rain, they had to move all their equipment back into the marquee. It went very well, especially when the jazz band played music by Glenn Miller and quite a number of the Home Owners joined in the singing. And after they had finished playing I took Daddy across and I went and spoke to a number of the players. I got on very well with the lead singer who I heard Daddy say to her that she reminded him of Dyan Cannon who at one point was married to Cary Grant. When Daddy walked in to the Reception area, one of the Home Owners asked him how I was so Daddy brought me in to see him and I can’t tell you how delighted both he and his wife were when they saw me.